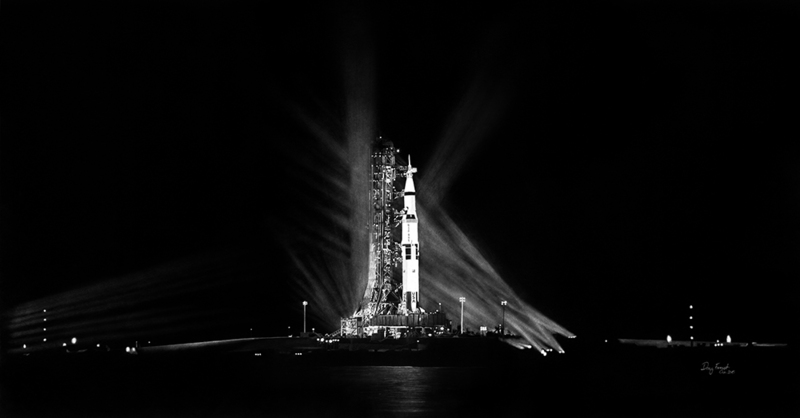 Graphite pencil on paper – I always really liked this image of the white Saturn V lit up at night, just before launch. I made me want to go too. Rick Armstrong told me that he could vividly remember this view, the night before his dad went to the Moon. This drawing was an experiment, because I wanted the blacks to be really black. Much more so than even the softest pencil could create. I drew it as a negative (black rocket on white paper), so that I could reverse it when I printed it and avoid having to fill in all the black. Of course, getting all the grey levels of the lights proved to be much more of a challenge than I had anticipated, and there were a lot of revisions before I was happy with it. Needless to say, I will probably never repeat the experiment.